In the months leading up to our Portland trip, Justin and I joked that we were going to come back to Brooklyn sleep deprived, full of amazing food, and overly caffeinated. It’s not that we were worried—I was eager to be jittery and full! I had created a list of all the places we wanted to visit, and using this three page single spaced Word Document as a clue, we knew that there were simply too many restaurants, cafes, and coffeehouses to see in our 4 day trip. Compromises had to be made somewhere! 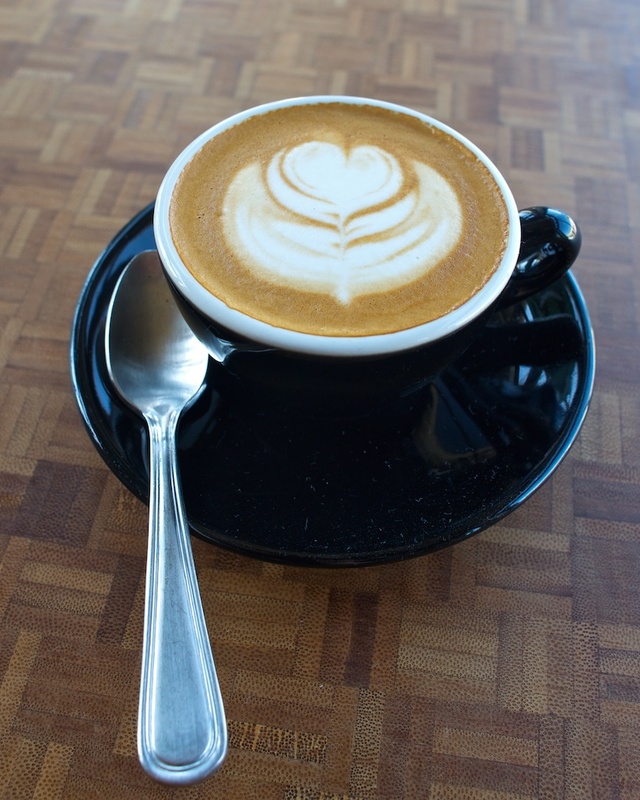 A word about the Portland coffee scene: it’s incredibly friendly. The roasters and baristas are passionate and far from standoffish. Each coffee roaster—with the possible exception of Stumptown, which has a substantially larger operation—is friendly with each other, working independently yet recognizing their interconnectedness. Each barista we talked to was focused but willing to talk for as long as we wanted. Just like Dora’s baristas spoke fondly about Portland, many of Portland’s baristas got that same dreamy look in their eyes when talking about coffeeshops in Manhattan, specifically mentioning WTF, Gimme, and Café Grumpy. 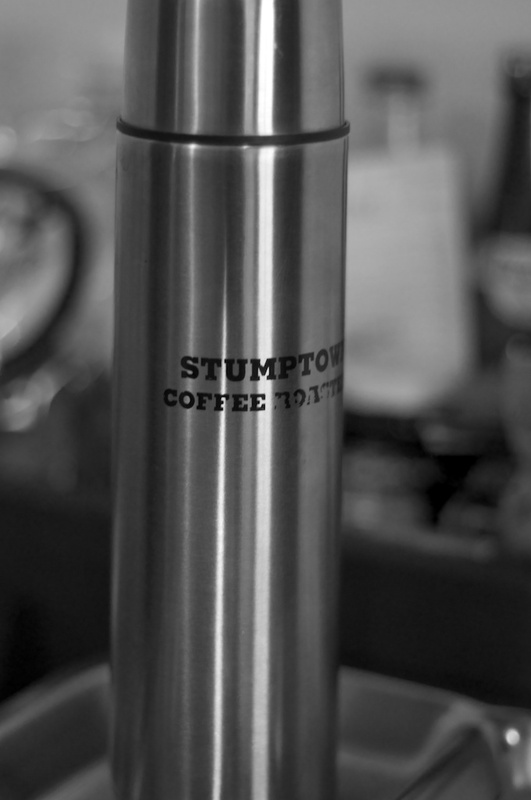 In terms of drinks, I started each morning with Stumptown, either in the room or at brunch. The Ace actually provides each room with a “coffee room service” menu, which offers up choices and tasting notes for every bean and roast Stumptown offers. 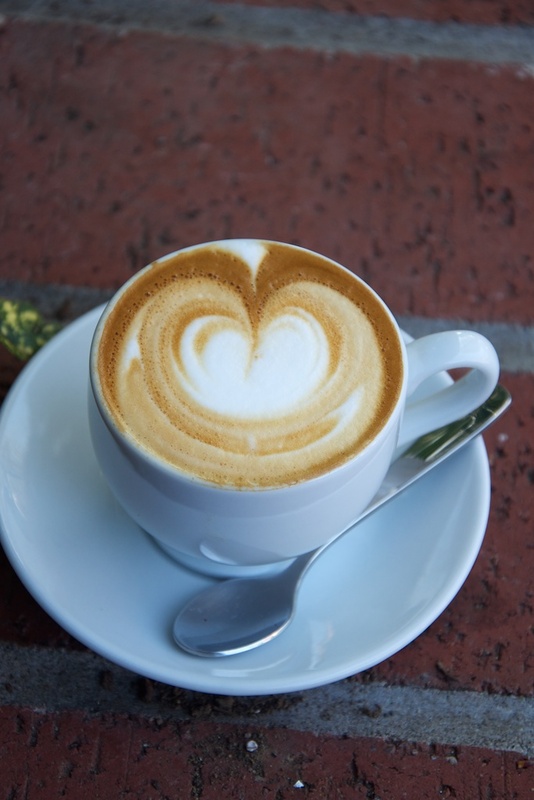 Each afternoon, I tried a macchiato for whichever coffeehouse we visited that day. Justin varied it up, taking advantage of each shop’s pourover options. Each macchiato was exquisitely prepared, the espresso’s bitterness melding perfectly with the foamed milk. Most shops actually offered a choice of espressos, each with their own tasting notes, helping to create perfect drinking experiences. So where did we end up going? 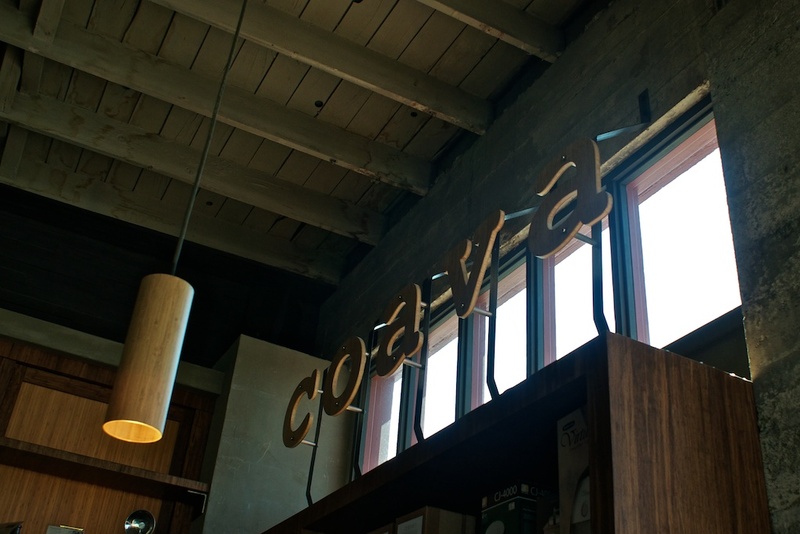 Besides the Stumptown in the Ace Hotel, we stopped by Coava Coffee on our first full day in the city. Coava (Turkish for ‘green coffee’) is committed to sourcing single origin beans and perfecting the roast and brew method for each bean. In addition to coffee, Coava created and sells a kone coffee filter for use in a Chemex. You use this filter in place of paper filters, resulting in a much more sustainable way of brewing coffee (as well as a really cool look and taste—we bought one and have loved using it). We had heard of Coava from multiple sources -- Oliver Strand had written about the kone filter, which we experienced first hand at Fort Greene's WTF. 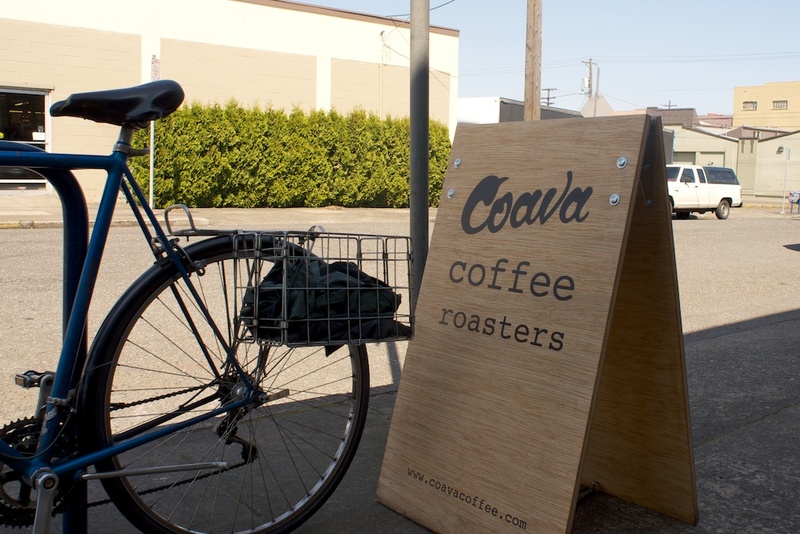 Coava’s Sam Purvis and Devin Chapman gained further notoriety for the shop when they took home first place at the Northwest Regional final of the US Barista Championship (and Brewers’ Cup). And Justin and I had actually ordered beans from Coava some months ago, a Honduras that resulted in some of the best coffee we’ve brewed at home. 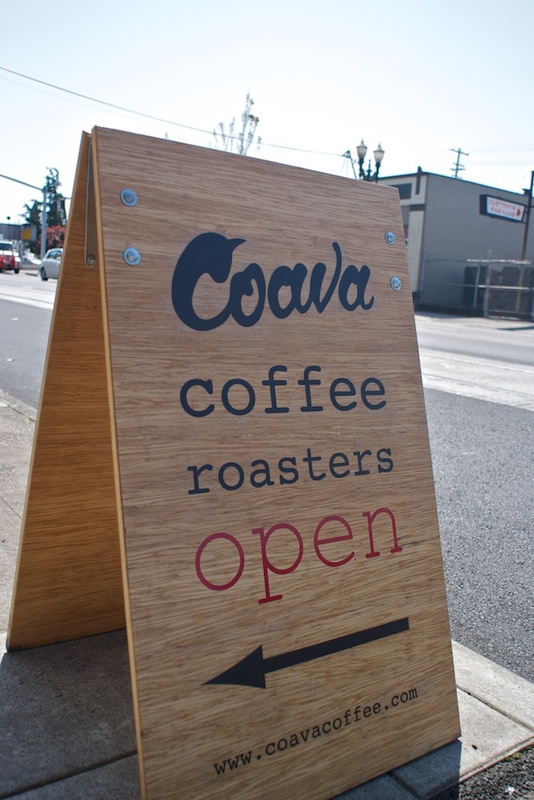 The drinks we enjoyed in Portland completely lived up to our expectations; as an added bonus, Coava’s café is housed in Bamboo Revolution, meaning that visitors can browse sustainable floors, blinds, and furniture, while sipping an excellent drink. 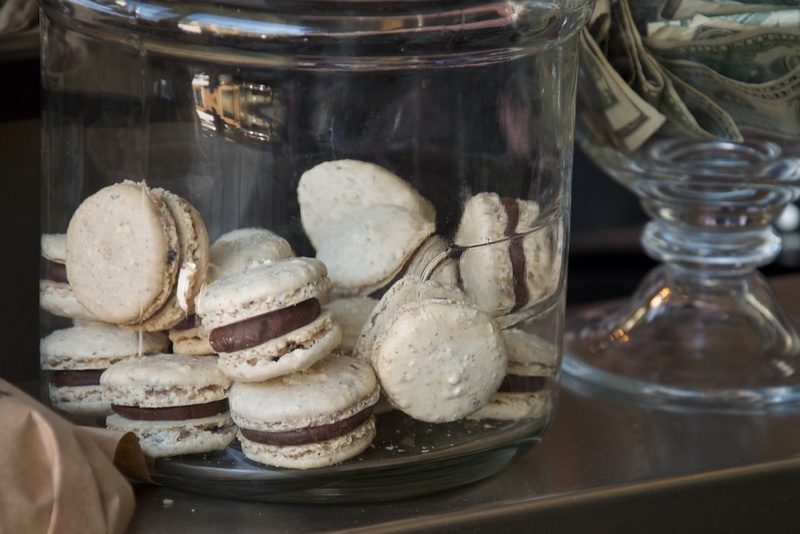 On Saturday, we were pleasantly surprised to see Café Velo at the PSU Farmers’ Market. Because Café Velo is located in downtown Portland, the café is shut on the weekends, so I assumed we wouldn’t make it until Monday (or at all). Justin joined the 25 person line, while I wandered away to take pictures. 20 minutes later, we happily sipped on individually poured coffees from Greyhound Roasters, accompanied by the world’s best breakfast burritos. Café Velo operates much like Manhattan’s RBC—they source a variety of beans from top notch roasters and offering the daily selection on a chalkboard. Just as we were impressed by the level of food knowledge on display at the Farmers’ Market, customers at Velo’s cart seemed to navigate the ten or so coffee choices with ease. Later on Saturday, after wandering the waterfront, we drove up to Portland’s alphabet district. The 23rd Ave shopping corridor is tree-lined and full of high end chains, with a few local gems mixed in. One of those gems is Sterling Coffee Roasters, an offshoot of Coffeehouse Northwest, tucked beside a Trader Joes. 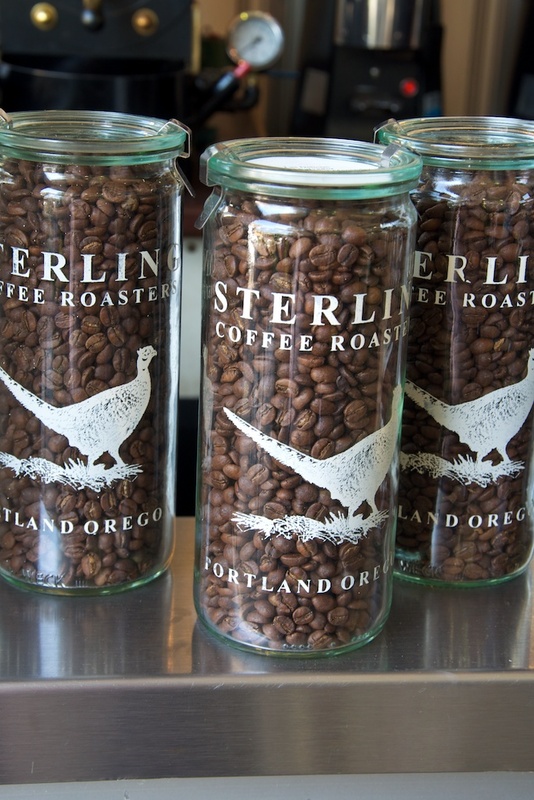 Sterling features Portland's smallest commercial roasting machine (according to Eater). Eric, one of the owners there, was extremely friendly and told us that Sterling went through 80 coffees in its first year! All of the shop's coffee is roasted in one-pound increments, each batch taking between 10 and 15 minutes. Sterling offers an incredible variety of coffees and encourages its customers to pay more attention to origin -- my espresso was one of a series of seven from different microlots of a single farm. We were in awe of Saturday’s weather—70s, zero humidity, a slight breeze—and were able to drink our delicious coffees while perched on the stoop in front of Trader Joes. On Sunday, after an amazing brunch (more on that in a future post! ), we drove to the Alberta Arts District, to wander and visit Barista. With the exception of Coava’s space, Barista was the largest coffeeshop we visited, with enough table space for at least 40 customers and their respective laptops. Beyond being large, the space is beautiful (think: leather chairs, a copper bar, dark wood shelves). It also offered one of the most stunning espresso machines we’d ever seen--a Mistral, from La Marzocco. While espresso is generally prepared at a constant 9 bars of pressure, machines like the Mistral and the Slayer (which RBC has) allow barista to alter the pressure to further refine the flavor profile of the drink (*This last sentence was provided by Justin, in case you couldn’t already tell!) We drank two delicious macchiatos from Ritual Roasters. We ended our last day in PDX with several different coffee experiences. 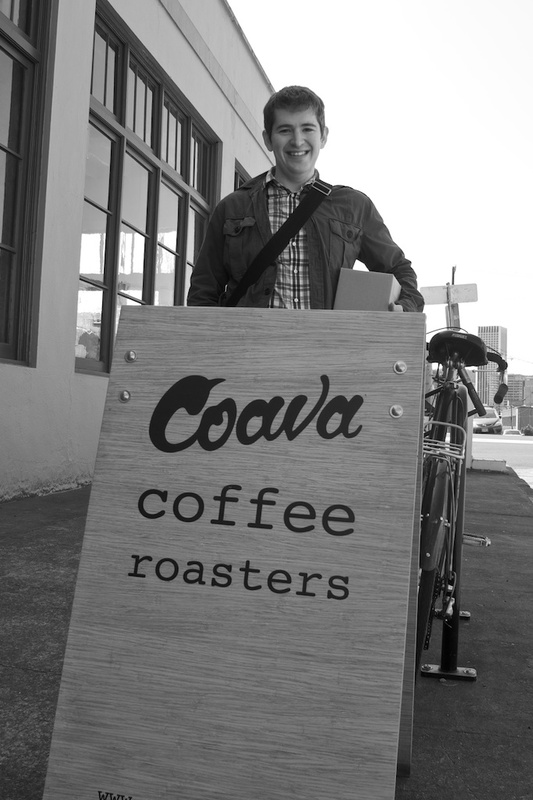 Before traveling to the West Coast, we’d been in touch with Mark Hellweg, owner of Clive Coffee. I’d first heard about Clive Coffee via both Pigeon Toe Ceramics and Design Sponge’s websites. Pigeon Toe, helmed by Portland based ceramics artist Lisa Jones, creates clean, Scandinavian inspired objects for kitchen, home, and garden. Early this year, while browsing the collection, I saw a beautiful (and functional) object called ‘The Clive Stand’. Clive Coffee collaborated with Carthagh Craft & Design and Pigeon Toe Ceramics to design a pour-over coffee holder that’s beautiful and unique enough to display permanently in your home. The salvaged Oregon Walnut holds Pigeon Toe’s pour-over cone and a Pigeon Toe mug. A little more research into Clive Coffee unveiled more stunning collaborations with Pigeon Toe, as well as discovering Mark’s unique business model. 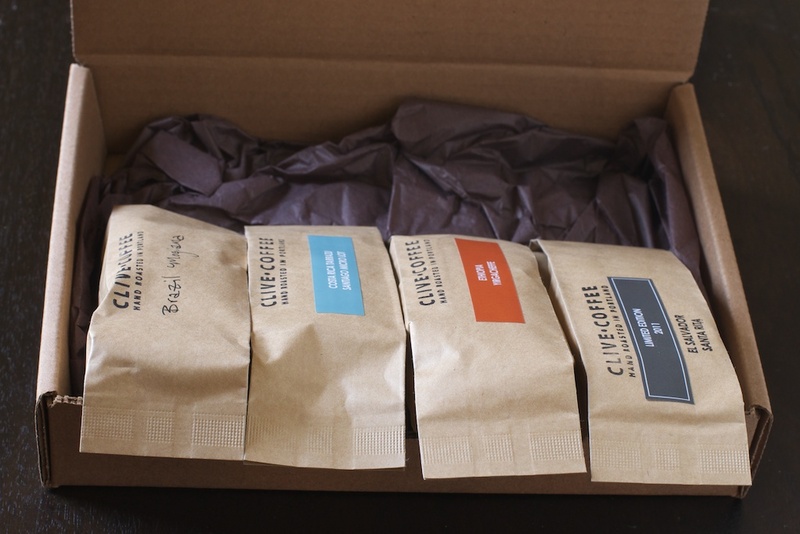 Capitalizing on the coffee wave, both in Portland and other cities across the country, Clive Coffee aims to be a one-stop resource for both consumers and roasters. Locally, Mark organizes cuppings, gatherings for coffee roasters, and in-person demonstrations of machines and brewing methods. For those who don’t live in Portland, Clive Coffee has detailed explanations for any way one would want to brew coffee or make at-home espresso. As an added bonus, Clive also sells their own coffee, roasted on a rented Probat. 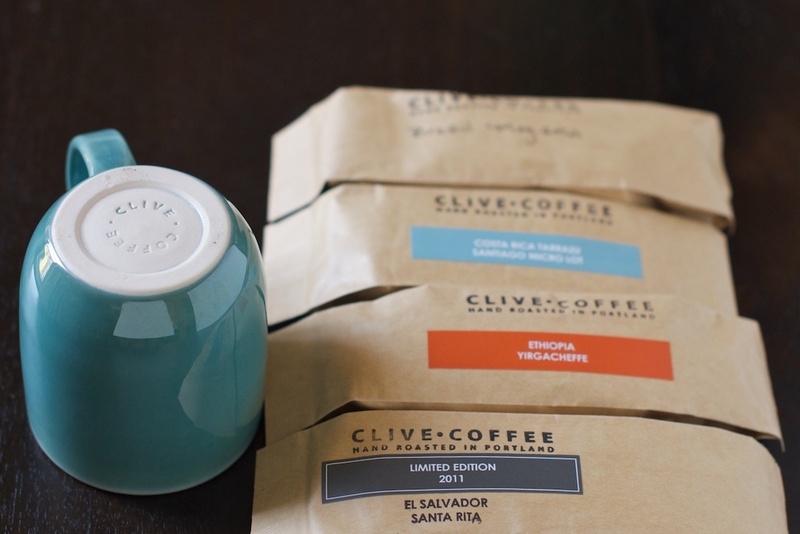 You can choose Clive Coffee by category, region, or flavor profile, and buy a few bags or set up a recurring delivery. Justin and I had the chance to view the showroom, trying out this at-home espresso maker (while I don’t care for the design—and you might see why!—it did result in a delicious espresso at an affordable price). After wandering the showroom, we grabbed some food and drinks with Mark, across the street at Beaker and Flask. Finally, wanting to squeeze in one more coffeehouse before heading to the airport, we ended our Portland trip at Public Domain. Besides having one of the best logos (I had to get a mug! ), Public Domain makes a delicious cup of coffee. Justin was particularly excited to see them offering a pourover of Panama Esmeralda, one of the coffee world’s most well-known coffees. (I was just excited to drink it!) 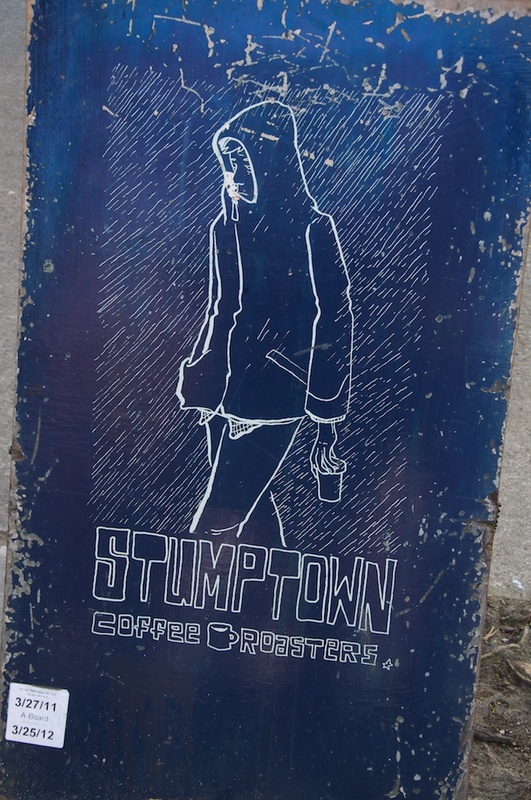 Under a year old, Public Domain is owned by Coffee Bean International, a nearly 40 year old Portland Roasting company. 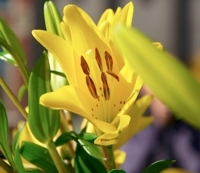 You can visit their website to see which beans and varietals they offer each week. So, as a final tally, we visited 7 out of 15 coffee shops on my original list. I’m ready to fly back to Portland and complete the list! If you’re inclined to reflect on the previous year, I suggest that you save and then categorize a year’s worth of coffee bags.